Our aim is to develop a new generation of bio-inspired macromolecular systems able to convert solar energy to fuel. The group objective is to design and construct chromophore-protein assemblies based on abundant and biodegradable materials with the capacity to absorb, transfer and convert sunlight into electrochemical energy with high efficiency. The resulting energy and electron transfer dynamics in these assemblies will be investigated by ultrafast laser spectroscopy. Ultimately, the optimized systems will be incorporated into devices to provide a renewable, safe and inexpensive energy solution towards a sustainable future. The current energy approach is not sustainable. Our reliance on fossil fuels produces the dangerous accumulation of carbon dioxide in the atmosphere that, in turn, has disastrous consequences for the environment and for our health. Therefore, a change of paradigm is required. The most obvious solution resides in nature, more specifically in photosynthesis, the fundamental biological process by which solar energy, water and carbon dioxide are converted into oxygen and biomass. Currently, we are running photosynthesis backwards. We burn fossil fuels, which are the result of biomass created by photosynthesis and stored underground during millions of years. To avoid the problems derived from our reliance on fossil fuels, in our group we propose to run photosynthesis forward. By applying the knowledge about the design principles that lead to efficient solar-energy collection, transfer and conversion in photosynthesis, we aim to engineer bio-inspired chromophore-protein assemblies able to convert solar to electrochemical energy (in other words, able to create a light-driven separation of charges). These assemblies will be incorporated into devices, more specifically, they will be attached to electrodes to produce electricity, and coupled to catalysts to drive water splitting and the production of hydrogen, a carbon-neutral solar fuel. Steady-state and time-resolved spectroscopic techniques will be applied to investigate the electronic properties and the energy and/or electron transfer dynamics in the constructed chromophore-protein systems. Some of the most relevant steady-state techniques for our research are absorption, fluorescence, linear and circular dichroism, Stark, Raman, and Fourier transform infrared spectroscopy. Two ultrafast time-resolved techniques are the focus of our investigations, transient absorption and two-dimensional electronic spectroscopy (2DES) which operate in the femto-to-nanosecond (10-15-10-9 s) time scale. In transient absorption spectroscopy, also referred as pump-probe, a laser pulse absorbed by the system under study initiates an energy and/or electron transfer process that is then followed in time by a second laser pulse synchronized with the first one. By delaying the second pulse (the probe) with respect to the first one (the pump), the absorption changes induced by the pump are followed as a function of time by the probe. Therefore, the energy and/or electron transfer dynamics can be investigated with high time resolution, typically around 100 fs. 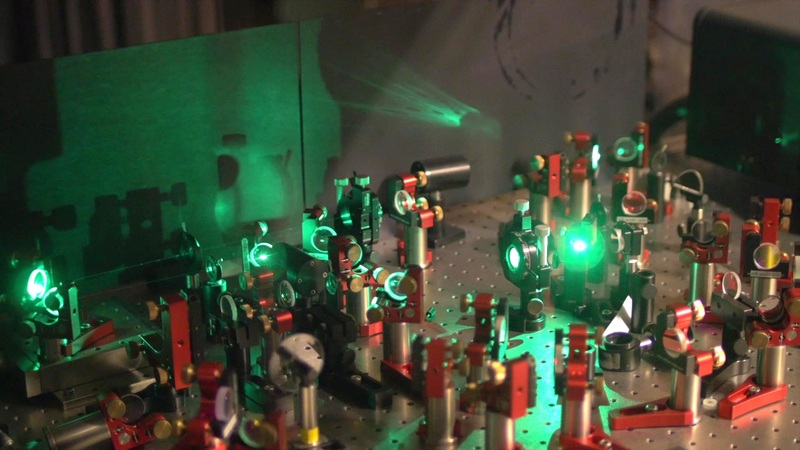 In two-dimensional electronic spectroscopy (2DES), four spectrally broad (100 nm) and temporally ultrashort (15 fs) laser pulses are utilized; three pulses generate a photon echo signal that is detected with the fourth pulse. This sophisticated spectroscopic technique presents several advantages with respect to transient absorption; it provides direct evidence of energy and/or electron transfer processes as well as about electronic coupling among chromophores and, remarkably, unravels the presence and role of quantum coherent effects. The combination of these spectroscopic techniques will allow us to build a consistent physical picture of the mechanisms that determine the efficiency of energy and electron transfer processes in our engineered (multi)chromophore-protein systems.